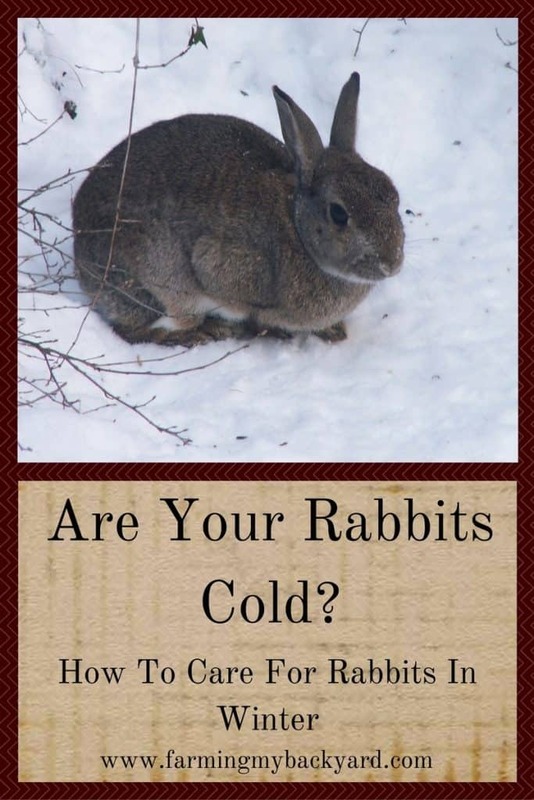 Rabbits are one of the more cold resistant backyard animals, but they still need a little extra care when it dips below freezing. Make sure your rabbits aren’t cold! Although I live in mild Portland, Oregon we usually get a few storms of icy and snowy weather in the winter. 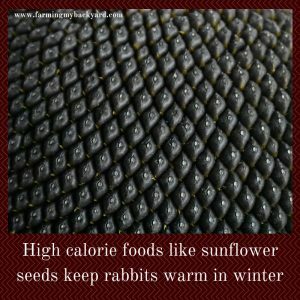 If you live in a colder area, rabbits could be a very good livestock choice for you, as bunnies are pretty easy to take care of in the cold. The one caveat is if it gets super duper cold, (as in ten degrees below) their ears can get frostbite. If your area gets that cold, you’ll need more robust shelter for your rabbits in winter than a basic outdoor hutch or colony. The biggest concern for rabbits in cold weather is keeping their water liquid. 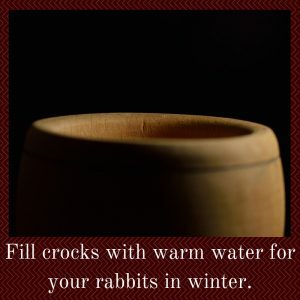 Most people choose to carry out warm water twice a day to their rabbits. Crocks stay unfrozen longer than water bottles because the spout on the water bottle freezes quickly. Also, the rabbits can lick the ice in the crock if they really need to. If you get caught unprepared, large tuna cans will work. Just make sure to crimp or smooth down any rough edges. Do NOT underestimate how important it is to water your rabbits twice a day when it is icy. Dehydration can kill your rabbits extremely quickly. Regulating their body temperature in cold weather takes more energy. Give your rabbits a little extra to help them stay comfortable. Rolled oats and black oil sunflower seeds are high energy foods. You can sprinkle them on top of their regular food, or increase their ratio if you mix your own feed. As always, be careful with the treats because sudden changes in diet can kill your rabbit. You may also want to keep an eye on their body condition to make sure they don’t gain weight. Rabbits in winter can get fat and then have trouble getting pregnant come springtime! If you keep rabbits in hutches, make sure that they are out of the wind and drafts. I like to use a deep litter method in my colony and in my hutches to provide extra warmth. A thick layer of hay that you add clean hay onto every day will compost down and create a heat source. For rabbits directly on the wire, make sure to give them at least a cardboard box stuffed with straw to go into when they get cold. If your outdoor hutches have lots of drafts you can staple plastic sheeting or cardboard around it for more of a wind barrier, but seriously consider better housing if this is your long term plan. I have put up cardboard across the open fronts when we have sudden drops in temperatures or unusually high winds. 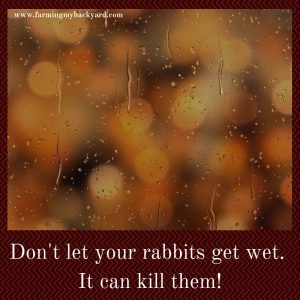 Obviously, don’t let your rabbit get wet, that’s a great way to end up with a sick or dead rabbit. I have had winter litters in our rabbit colony in an unheated garage without problems. I know some breeders breed year round in hutches with minimal losses. If you are really worried about your kits then you can bring them inside and take them out to the doe at dawn and dusk for feeding. (Rabbits only nurse their young twice a day! Some days I wish I was a rabbit). If you have good mothers they should pull plenty of fur to keep the babies warm even if it’s below freezing. The greatest danger is to newborn kits. Keep a close eye on any does who are due and make sure she pulls plenty of fur and gets all the babies into the nest box. If you find cold ones you may be able to resuscitate them if you start soon enough. With just a little extra care you should be able to keep your rabbits comfy all winter. I can’t say the same for your hands when breaking the ice out of their crocks though! What winter rabbit care tips do you have to share? I live in Illinois so our winters get cold at times. For my rabbits I put the bottles up and go to crocks too (I have enough of them to take out and bring frozen ones in to clean and take back out ). I water at least 3 times per day when really cold. They live in wire hutches with a tarp back and each rabbit has a wooden house that I fill with hay the side and bottom of hutch is open and it has a tin roof. They get all the hay they can eat and pellets in the evening and treats in the morning. 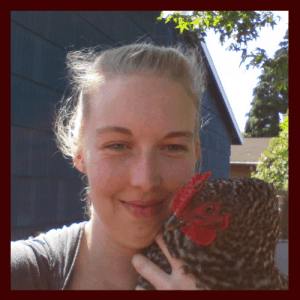 My chickens get a heated dog dish and I fill it 3 times per day, they also have a small window left open with a screen on it for air flow and a small light bulb on for the winter to give them the light they need to keep laying good. Their run is partially covered with a tarp and 3 corners have roosts. My ducks I put their swimpool up and they get a large black rubber pan, that seems to do well for them in winter. Nice, sounds like it works well. This little rabbit lives under an embankment of spreading ewes. He comes out early am, sits in sun the retreats. It’s freezing and I am worried as to what to give him . Maybe hay, water will freeze. He has a furrow that’s protection. Do not see him in day. If he has a burrow he’s probably pretty comfortable! Underground temperatures tend to stay consistent around 50 degrees, plus he will have a thick undercoat to help him stay warm. If you want to, he would probably appreciate non-frozen water and some hay. Rabbits are mostly active in the morning and evening and tend to lay low during the day. Do you know a way that have enough fresh water in a colony for a few days? I’m leaving in Québec and our winters are really cold. I want to raise rabbits, but I want to have the possibility to go outside for the weekend and not care if the rabbits have enough of water. How many water a day need a colony of 1 buck and 2 does? And does rabbits puts dirts in their water so I should change it lot of time? You should definitely change the water if there is dirt in it. The waterers I used most of the time were the kind that have the little ball bearing in the end of the metal tube that screwed onto a two litter soda bottle. Those last for a few days if it is not freezing. It’s a good idea to have one waterer per rabbit. Fill up a dish with snow. This is how wild rabbits and other wild animals get their water in winter. Yes, even frozen water in crocks they can lick and get some water. Mine always seemed to appear warm water though. Yes, that’s absolutely a great option. They may not even need heat if they are in a building like a garage. There are plenty of heated water dishes on the market. It’s silly to allow the water to freeze and have to refill it multiple times a day when you can simply invest in a heated water dish. Also, outdoor rabbits should have access to the ground and be allowed to burrow so they can stay cool in the Summer and warm in the Winter. Put a hutch within a dog kennel and you’re rabbit will be much happier. Do they have any drafts in the shed? Can you make a smaller area stuffed with hay for them to get into? If it’s a short term cold spell, you may want to bring them inside or put a safe space heater out there.